Got to admit I’ve been slacking lately on updating this blog. It’s been a combination of less than epic conditions and spending time breaking in new gear. I finally broke down and bought a split board (Voile Mojo RX 66) after one too many post holing sessions in the backcountry. It’s a lot of fun and lot easier to use than I thought and is opening up a whole new range of possibilities. So between testing out the new board and my lack of luck at the resorts I’ve been spending a lot of time at my favorite local haunt – Berthoud Pass. The other piece of gear I’ve been experimenting with lately is my helmet cam (Contour HD). What I quickly discovered is that without a person in the shot the helmet cam footage gets old quickly – you really need to be following someone else or get yourself in the picture somehow to give some perspective and visual contrast. In looking around the web, I saw all sorts of clever ways to do this including Joel Bettner’s reflective googles trick. 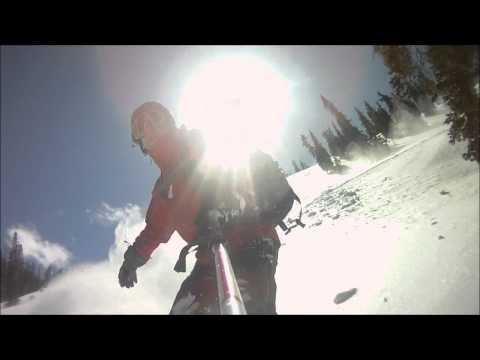 But clearly the most frequently seen approach to better utilizing a helmet camera is mounting it on the end of a ski pole like I do in the video below.